Supernatural Otherworld creatures in Irish, Scottish and Manx folklore. The Púcaí are mysterious supernatural creatures found in the indigenous folklore of Ireland, Scotland and the Isle of Man whose origins in Gaelic tradition are unclear. They do not appear under that name in the early literary cycles and are more likely to be part of folkloric developments in the post-Medieval period, especially in Ireland. Since a number of similar creatures exist in Gaelic folk-belief it is probable that we are dealing with a class of being derived from one or more native prototypes albeit heavily influenced by the presence of Scandinavian and English settlers and their traditions. 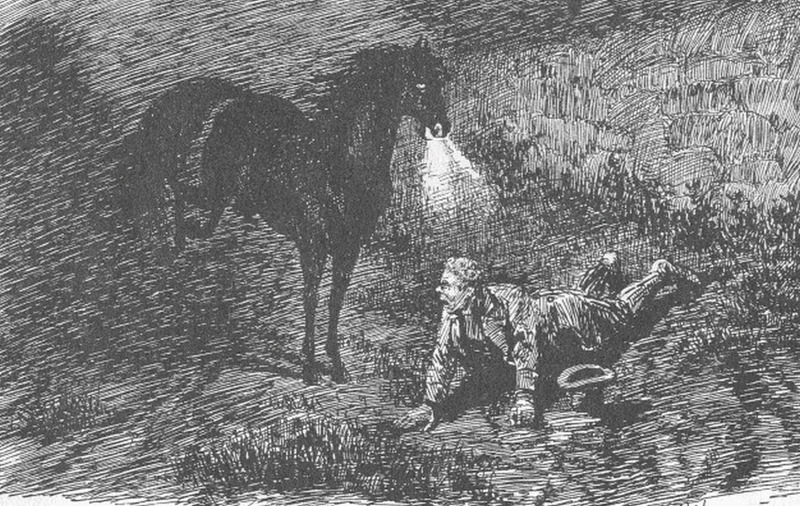 The Púcaí were solitary supernatural creatures from Irish and Scottish folklore that usually appeared in animal form (a black-coated horse, goat or dog), more rarely in monstrous human form, and were either indifferent or hostile to human life and affairs. The mythological authenticity of these beings is highly debatable. Their relatively late appearance in Irish and Scottish folk tradition is regarded by many as an indicator of a non-Celtic origin. Evidence for this is shown in the word Púca itself which is cognate with several terms describing very similar beings in a number of non-Celtic Germanic languages, perhaps indicating an importation from Medieval or post-Medieval Scandinavia or England (c.f. the Modern English “Puck” derived from Old English “Puca/Púcel”, Icelandic “Púki”, Norwegian “Pukje”, Frisian “Puk”). However others challenge this interpretation by pointing to the Celtic Brythonic language-family of Welsh, Cornish and Breton which also contain pooka-style words (c.f. Welsh “Pwca”). They argue the difficulties of a more-or-less simultaneous adoption by several Celtic speaking peoples of a pooka word, pointing instead to a reverse process of a Celtic concept being assimilated by the Germanic-speaking peoples (by English invaders in Britain and Scandinavian settlers in Scotland and Ireland). Difficulties with both views have led to a suggestion that the similarities of the northern pooka tradition derive from a common, if extremely distant, Indo-European myth and the belief in supernatural or elemental creatures that are not quiet divine. Related to this is the possibility that a literary antecedence for the folkloric Púcaí can be found in the Gabharchinn (singular Gabharcheann), a mysterious race of beings referred to a number of times in Medieval Irish and Scottish texts. The name is clearly derived from the Irish words gabhar “goat / (white) horse or mare” and ceann” “head” and literally means something like “Goat- / Horse-headed One”. Given that gabhar is an indigenous Irish term for a goat (and a particular type of horse) and púca more likely a late foreign loanword, could the Gabharchinn be an early prototype for the much later Púcaí? 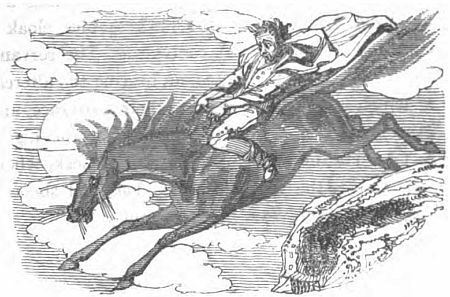 Though the demonic-like Fomhóraigh may have had an influence on the characteristics of the Púcaí in Irish folklore any direct connection between the two is debatable (however one Middle Irish passage talks of the “luchrupain ┐ fomóraig ┐ goborchind” as if they were closely associated). Irish and Celtic mythology in general has many examples of animals, mainly hounds (or wolves), deer, swine, certain species of bird, and more rarely cattle or horses, that are closely associated with the Otherworld. Equally human-like Otherworld denizens temporarily assuming animal-form is a relatively common phenomenon in many of the earliest stories. These shapeshifters are sometimes able to communicate in human speech despite their bestial guises, something which can also characterise the Púcaí. Another mythological candidate for links with the Púcaí is the Bocánaigh, possibly goat-headed creatures of the air that haunted battlefields and areas of combat in early Irish and Scottish literature. The straightforward identification of the Púcaí with the Lucharacháin in modern encyclopaedias or fiction is the result of contemporary confusion. As pointed out above, while there may be some association between both it is unlikely that they are the same class of supernatural being. It is more likely that late Medieval Irish and Scottish scribes had an image in their minds of a vaguely related group of beings or creatures that included the Fomhóraigh, Lucharacháin and Púcaí / Bocánaigh / Gabharchinn on one hand contrasted with the Tuatha Dé Danann / Aos Sí on the other. In summary it would seem then that the folkloric Púcaí are an amalgamation of several influences, both indigenous and foreign. The Eich Uisce or “Water-horses, kelpies” are dangerous supernatural creatures from late Irish and Scottish folklore that normally appear in equine form near water (fast flowing rivers, lakes or the sea’s edge), though occasionally they can adopt the guise of a beautiful young woman or man. While they may seem to be quintessentially Celtic many scholars believe they have a foreign origin and were adopted into the Celtic cultures of north-western Europe at a late date since there is no explicit references to them in any of the surviving early Celtic literatures. However, like the Púcaí above, several native traditions may have contributed towards the development of their myths. Shape-shifting amongst the Otherworld community (the Tuatha Dé Danann and Aos Sí) is commonplace in early Irish and Scottish legends, with several animal forms favoured by their number. Encounters with members of the Otherworld folk at lake-edges, rivers and river-fords is equally common, especially in those stories of warriors and aristocrats (and later saints) meeting Otherworldly maidens. One major reason for this is that such places represented boundary zones (what modern anthropologists dub in Latin liminal places). In a Celtic context these places were of enormous importance. 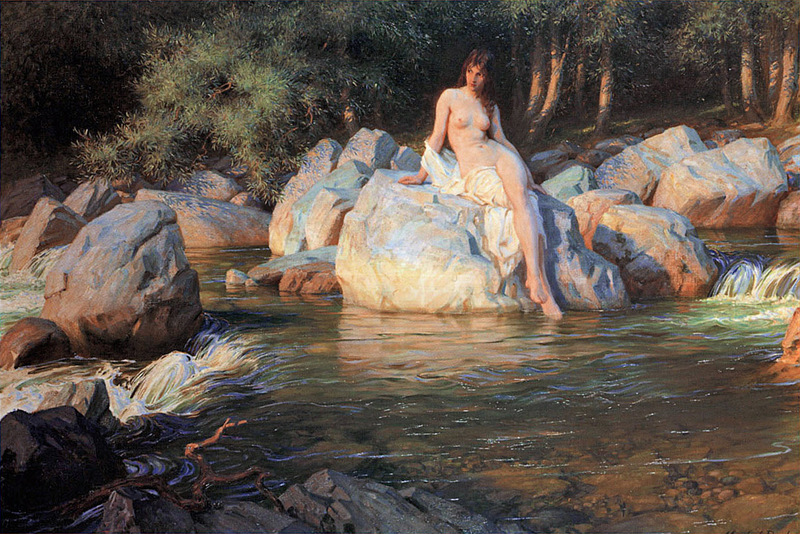 A river or ford often marked the boundary between different territories, as well as between dry land and water, and wherever boundaries of any form butted up against each other in the Celtic lands the barriers between this world and its supernatural equivalent became more tenuous or permeable. For the Irish, Scots and Manx it was through the cracks in the ordered world that the supernatural crept in. Wells, springs, lakes, streams and rivers (and the sea itself) were believed to give access to the Otherworld beneath (hence the archaeologically attested Celtic practice of votive offerings in lakes, rivers, etc.). Otherworld animals entering our world occasionally used such places to do so and references to supernatural cattle, horses, deer and swine in relation to rivers and lakes can be found throughout the legends of Ireland, Scotland and the Isle of Man. Together these would explain various aspects of the Eich Uisce, and their origins are probably not unrelated to that of the Púcaí. Victorian folklorists and populist writers who attempted to draw a firm distinction between the Púcaí, Eich Uisce and other related folkloric creatures were only partly correct since they stemmed from a more ancient tradition of Otherworldly peoples and creatures common to the Celts. In fact it is not unreasonable to suggest that the Púcaí and Eich Uisce were originally different aspects of related folkloric beings that emerged from 15th, 16th and 17th century Ireland and Scotland as coherent native traditions slowly succumbed to foreign colonial pressure and Gaelic civilization began to crumble. What about the “Sea-Cat” in Flann O’Brien’s ‘An Beal Bocht’. Any idea where he got that from?